Poetry exists in the ears of the beholder. Sound—listened to out loud or internally—grabs one first. As the words wrap into our consciousness, we begin to feel their depth and value. We move toward an appreciation of the meaning conveyed by the words and grapple with the symbolism utilized by the poet to enhance our enjoyment. We notice the structure, the way in which the words align on the page. We feel the rhythm inherent in the words and meaning. We read the poem a second time with a different emphasis to determine if the meaning is more clearly revealed or even changed. The poem must speak on a personal level to be counted a success, even if it says different things to different readers. Major Jackson, who teaches at the University of Vermont, reminds us, especially those who are in the education profession, that “even the toughest kid / on my block” may be a genius, in this case at chess. “Mighty Pawns” reveals “Earl’s ferocity…for fear he blames / you and proceeds to take your Queen.” Conversely, Natalie Diaz, a teacher at Arizona State University, brings another personal education memory to the fore in her poem “My Brother at 3 AM.” It may not be the image she sought to convey, but the very title reminded me of students with whom I worked whose mothers locked them out of the house until the early hours while she turned tricks to survive. Other poems talk about “my marvelous god,” “a bear batting at a beehive,” or having been “born as a woman.” The subjects have current and historical implications. For example, Tina Chang’s “Story of Girls” notes that “Years ago, my brothers took turns holding down a girl in a room.” While this relates a song of innocence, it resonates given the current hearing to approve a potential Supreme Court Justice. Layli Long Soldier is a citizen of the Oglala Lakota Nation and the author of “38,” which recounts the hanging of the Dakota 38 in December 1862, the same week that Abraham Lincoln ordered their hanging and signed the Emancipation Proclamation. Ironic. Tracy K. Smith teaches at Princeton and is the Poet Laureate of the United States. She won the Pulitzer Prize for her collection Life on Mars. In American Journal, she has selected and introduced an interesting collection of poems written by a remarkably diverse collection of poets. The subject matter is wide-ranging and thoughtful. Little, however, appears as traditional poetry. After re-reading many of the poems, no particular lines remain in memory, but much of the subject matter sticks. The center holds, and that is the essence of good poetry. 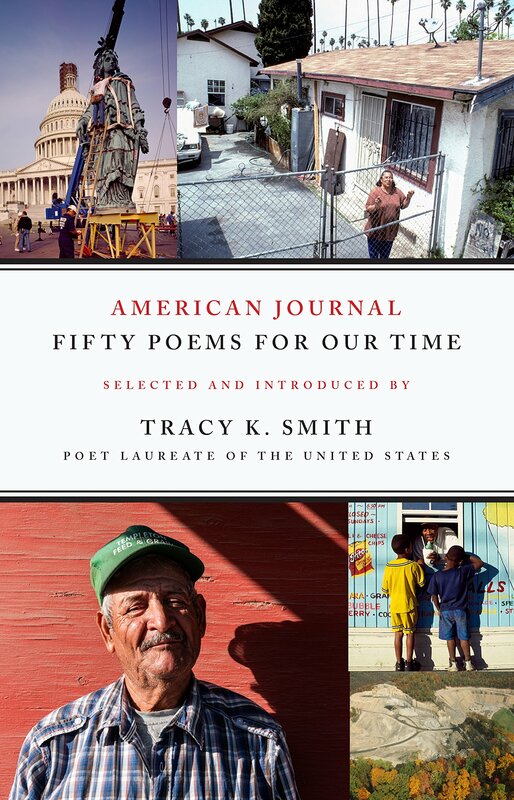 A collection of fifty poems on the American experience, selected by Tracy K. Smith, Pulitzer Prize winner and Poet Laureate of the United States.